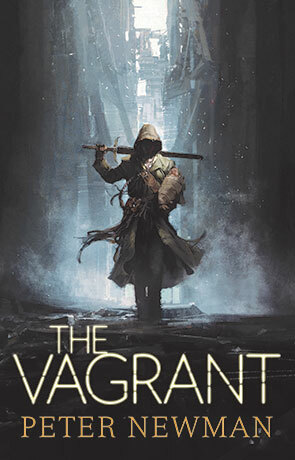 The Vagrant was an unexpected delight, showing up totally out of the blue with a mature, confident writing style and a deliciously dark and twisted world. The flawed protagonist known only as "The Vagrant" is a masterstroke — here we have a figure who doesn't give much away. He doesn't speak, but he passes through the post-apocalyptic, savaged land with knowledge, confidence and a hard heart. And yet he clearly cares and is single-minded in his protection of his unusual ward. Its this journey that lies at the heart of the book, along the way picking up characters just as unusual and flawed as the protagonist. Up against them are beings with tremendous powers and outcomes look bleak. The world is an unforgiving and violent place full of mutants and demons and general nastiness at every turn. And yet there are good people, kind people and those who just want to survive the best way they can. The plot is as unexpected as the book itself, never giving too much away and enticing the reader along for the journey — it manages to keep you on your toes not knowing what to expect next. I can't remember the last time I read a book with a mute protagonist and this book actually has two — I won't give away the identity of the second as the surprise is worth experiencing for yourself. The idea works remarkably well here, proving an air of the enigmatic about The Vagrant. The scenes between the two are just perfect (sometimes it difficult to know whom is leading whom). I have to say that this is one of the best books I've read so far this year, at times it reminded me of Stephen Kings Dark Tower series — it's got that same dark energy and bleak realism about it. The lead character also draws similarity, the same dark and brooding presence and that same self-confidence. I'd go as far as to say that The Vagrant matches Kings efforts and I don't think praise gets higher than that. Written on 1st May 2015 by Ant.